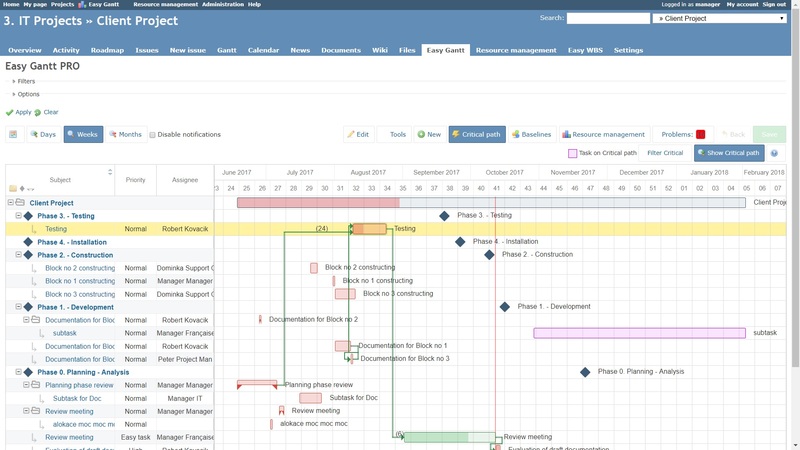 Drag & Drop Redmine Gantt Plugin makes planning and update of projects easy as never before. More than 30.000 downloads. UPDATE 4/2019: New version compatible with Redmine 4.x just released. With Easy Gantt plugin for Redmine you can plan and adjust timing using drag & drop, create issues, versions, relations, sub-issues. There are also advanced features of PRO version as Critical Path, Baselines and Global Gantt with drag & drop update of whole projects. Planning of your projects can be now easy as never before - faster, more visualized and synchronized. Compatible with Redmine 3.2.x, 3.3.x, 3.4.x, 4.x. In the next step, we will ask you for your billing information and payment method. More about features of Easy Gantt PRO? In project management, a baseline is the project's original plan. This original plan is visualized in order to compare it to the current project plan. 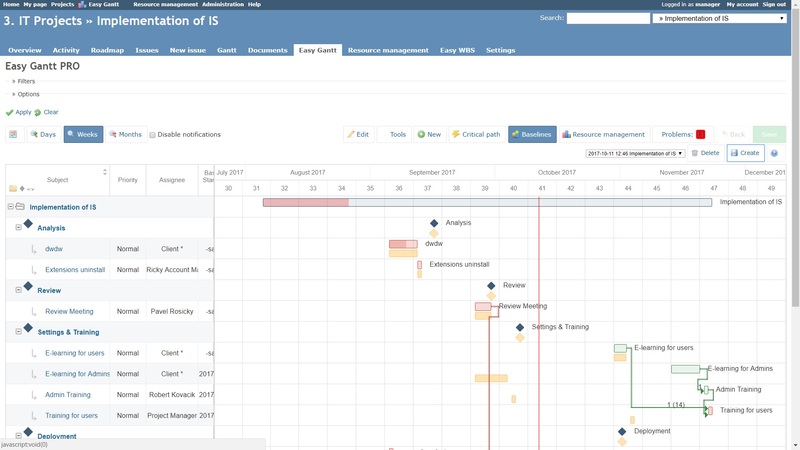 Easy Gantt PRO offers the feature of highlighting the baseline plan. Baseline plan does not change when the schedule is edited. 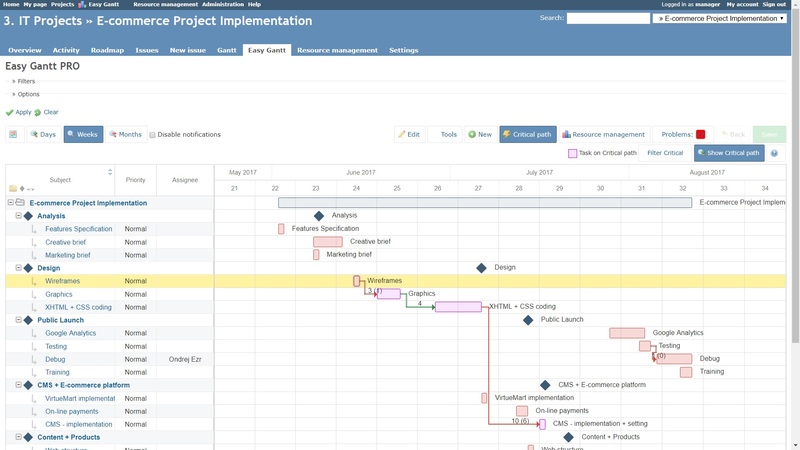 Redmine Gantt chart allows you to create more Baselines, which thus work as the snapshots of the project plan. Last update: Working with huge projects has been optimized in the plugin. A critical path is a sequence of issues that cannot be delayed or else the whole project would be delayed. Also, it shows the shortest time that the project can be completed. A issue within the project is considered critical if its due date can not be delayed since it would directly affect the project completion date. PRO Easy Gantt shows this sequence after clicking the button "Critical Path". Last update: versions are shown in print version. 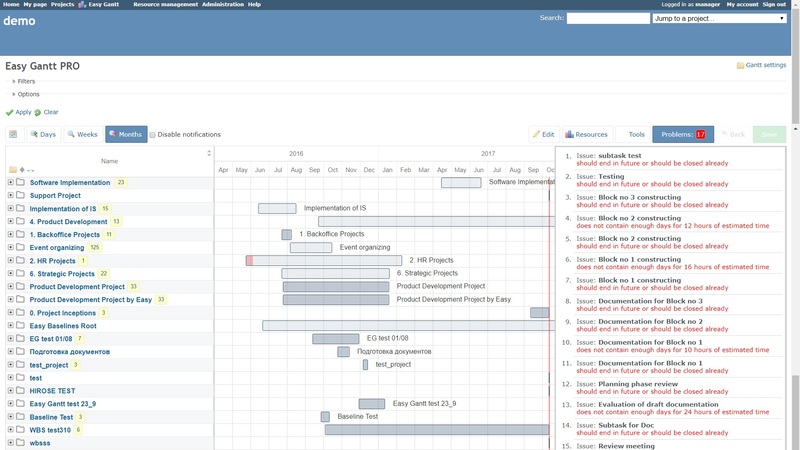 You can easily manage your project portfolio using "Gantt over Projects" feature. This Gantt shows the whole project in 1 bar while you can drag & drop it and thus change the timing of the project. You can also drill projects into detail from here. Just click on "+" icon next to the project name and see all the issues and versions - you can drag & drop these too. This Projects Gantt also shows you weighted project completion based on real weight (estimated duration) of the issues and their % completion. Last update: issue relation delay is counted only for workdays now. Pro version of Easy Gantt allows you to create new versions and issues right from the Gantt. You press "new item" and fill the form or drag mouse in the calendar to create new issue or version while planning the project. Last update: The design of the plugin has been overall improved. 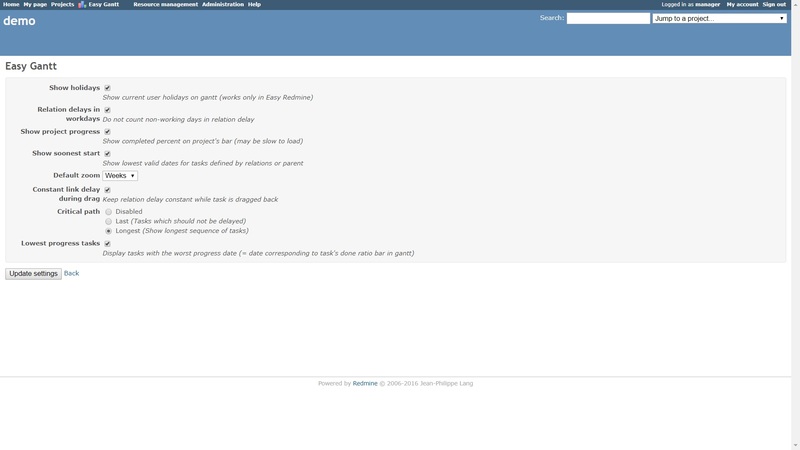 Parent and child issues are visualized in PRO version of Easy Gantt too. Parent issues can be drilled down to display their child issues. Redmine version: Compatible with Redmine 3.2.x, 3.3.x, 3.4.x, 4.x. Bug Easy Gantt - task under main project issue. Easy Gantt - task under main project issue. It is possible to select the date span for Gantt export. Both for global and project Gantt. Boost your Redmine with FREE Easy Gantt now!